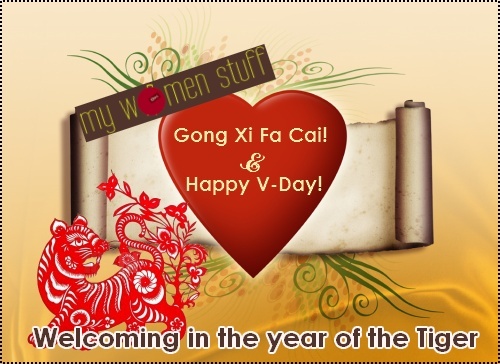 Home » Musings » Gong Xi Fa Cai – Happy Chinese New Year and Happy Valentine’s Day! Gong Xi Fa Cai – Happy Chinese New Year and Happy Valentine’s Day! Today is a most auspicious day. Not only is it Valentine’s Day, its the 1st day of the new Chinese Lunar year which heralds the start of a new year and the beginning of the Year of the Tiger in the Chinese Zodiac. I’ll be away for a day or two to spend time with my family and to celebrate the Chinese New Year but I’ll be back with more once I return to the city. If you too celebrate Chinese New Year, I wish you Gong Xi Fa Cai and may you have a happy and prosperous year ahead! To everyone else, and lovers everywhere, Happy Valentine’s day. PREVIOUS POST: Will Tangerine Orange nails bring luck? and not forgetting Happy Valentine’s Day to all too! Thanks babe! Hope you’re having a good holiday! Thanks and I hope you had a good one too!